In early 1985, the Hammerhead was sent to Mare Island Naval Shipyard for overhaul. It meant round-the-clock work for a year. 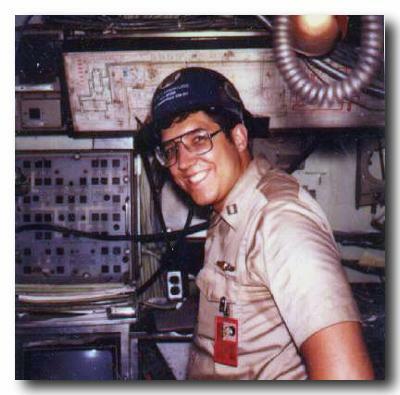 I had just passed my chief engineer exam at Naval Reactors in D.C., and having been pronounced "engineer qualified," I was sentenced to a life of 14 and 15 hour days aft in the plant, setting plant conditions so the shipyard could work on the plant. This photo was taken in the maneuvering room, the nuclear control center seen in the upper level of the engineroom in the sub diagram seen previously. This shot is taken from behind the reactor plant control panel looking to starboard at the engineering officer of the watch's station. I'm wearing my Mare Island hardhat pronouncing me the MPA, the main propulsion assistant to the chief engineer, who was Ray Lincoln. Ray went on to command the submarine Narwhal, and today he commands the submarine base in Groton, Connecticut. At the submarine museum near the base his portrait hangs, wearing a stern expression. I pointed to the photo and showed my wife Patti. "That's him, that's the Eng." We rarely called him Ray or any other name but Eng. Sometimes he was called Feng, the F standing for a popular four letter word. I had to wear my geek-glasses in the yard, the ever present weld sparks floating in the air murder on contact lenses. Note the dolphin pin, the sweatstained khakis, but I guess I wasn't working so hard that I missed out on a tan. Behind my head is the piping plan of the reactor plant, and behind that one of the temporary lighting bulbs that made the maneuvering room about 120 degrees. On the left is the panel depicting the status of the hull valves, which at sea is lit with green circles. In the overhead are the "chicken switches," used to shut the hull and backup valves in the event of flooding. A tricky thing, because shutting a valve kills seawater cooling flow which kills the propulsion plant, which means you can't propel your way to the surface. Flooding accidents are dreaded, because a mistake at the chicken switch panel - incorrectly keeping open a seawater system that continues to flood or shutting a system that is healthy that cuts out propulsion - can kill the ship.